Why do Cricketers wear white? Cricketers adorned in pristine white game uniform, dispersed around a crisp green is a familiar quintessential English sight to us all. However, why the white kit was chosen for a game that attracts both grass stains and the red scuff of a cricket ball is a little perplexing. So, what are the origins of our English Cricket Clothing? With cricket dating back to the 18th century the original cricket clothing was designed around the materials that were available, with gentlemen sporting their everyday wear of trousers, shirts and top hats. White became the colour of choice in the 19th century with the birth of professional cricket teams. With the attire remaining as trousers, shirt and jumper to reflect the gentlemen’s dress of the 18th century although head wear progressed to a woollen cap. It is suggested that the woollen cap kept the head warm even after perspiring unlike cotton that becomes cold when wet. Cricket whites, or flannels as they are known, go with an English summer like strawberries and cream, Pimms and Lemonade or cucumber sandwiches. The colour was chosen to coincide with cricket being a summer sport and hence it being the most appropriate colour to reflect the suns rays. It is certainly not the most practical colour for the sport, which can only attract grass stains and the red scuffs of a bowler’s cricket ball. Yet, there is romance and idealism in seeing the bleached crispness of a cricket team on a lush green pitch. 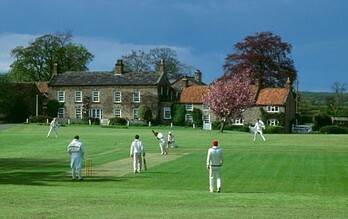 White was also chosen to reflect that cricket was a “gentlemen’s” game, as with tennis in the in the UK. Gentlemen used to dress “as neat as a new pin” and white was the colour used to reflect this. However, with cricket whites needing to be spotless for each innings it was found that many poor, yet talented players were kept away from the professional sport. It has also been suggested that white was chosen as a screen colour to enable the red cricket ball to be seen clearly by the batsman. Although Test cricket clothing remains white, players of One Day International and Twenty20 matches wear a specific team coloured kit, or pyjamas as they are jocularly know. The coloured kits are much more practical for these shorter games of cricket as a white ball is used for play and as games now play on into the evening the colours are sympathetic to artificial lighting. There are also added commercial benefits of the new coloured with replica kits now being available to supporters, just as with football. The chunky knit, cable jumpers have depleted except perhaps in a local Sunday league. Much more practical, short-sleeved t-shirts in breathable fabrics have replaced them. The long white trousers still remain, although are now manufactured in materials that avoid staining almost making that red cricket ball scuff a thing of the past. What do you think of the break in tradition? Does adding colour bring cricket in line with other high profile sports? We love to hear your comments.